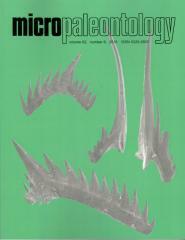 ABSTRACT: Four newmorphometric techniques were performed on the same group of specimens of the Palmatolepis winchelli group studied by Klapper and Foster (1993), and all four were successful in discrimination of the six different species of the group. The elliptical Fouriermethod provides the most biologically accurate representation of the element outlines, but does not keep track of particular landmarks or incorporate any biological information from inside the outline. The three landmark-based methods define locations on the element based onmaximum curvature along boundaries,maximum lateral extents, distinct anatomical features, junctions between features or boundaries (methods 2 and 4), ormeasurements made from geometries built from primary landmarks (methods 4 and 5).Discriminant eigen analyses of species groups for all three landmark methods were effective at separation of the species into distinct clusters of morphospace, but the convex hulls in method 2 showed the least overlap, showing that the landmark definitions associated with method 2 were themost efficient at distinguishing between species. This could be because method 2was a size-independent technique,while methods 4 and 5 were based on distance measurements and were therefore size-dependent. PCA(principal component analysis) of the same groups usingmethod 2 (landmarks) and method 3 (elliptical Fourier) were compared for three different groups of specimens. Bothmethods calculated the same morphological variation among the groups and in the same order of increasing eigenscores. These results demonstrate that both methods detected the same real morphological variability in the specimens. Both methods were equally effective in distinguishing between the groups, and both appear equally valid for representing morphological variability in Palmatolepis. Elliptical Fourier analysis provides the most accurate representation of the element outline in Palmatolepis, but landmark-based techniques provide the ability to associate statistical variationwith particular features on the element, including those defined by the central node, the carina, and concavity apex points along the outline.